Strawberry Tips for Tasty Super Berries! Strawberries are in the Rose family. The average berry has 200 seeds, the only fruit whose seeds are on its exterior surface! The seeds are really the fruit! Usually grown from runner daughters, they will grow from seed. Just throw down caps you bit the berry from. Sooner or later, you will have a plant you didn’t ‘plant.’ Strawberry seed saving is simple. Eight out of 10 strawberries grown in the U.S. are grown in California! Strawberries came in second to blueberries in the USDA’s analysis of antioxidant capacity of 40 fruits and vegetables. They are also rich in dietary fiber and manganese, and contain more vitamin C than any other berry. When do I plant strawberries? Not now, NOVEMBER 1 to 10! Yes, it’s that specific for winter chill at the perfect time! They start producing runners now, but cut them off until early July! Then let them grow, and cut off the new baby plants mid October for November planting. Or, just let them grow to fill spots where, for one reason or another, a plant has gone missing, needs replacing, and/or another could fit in. When those needs are taken care of, cut off the rest of the runners. These runner plant babies will grow so fast you will be getting berries from them late summer and fall if you have everbearers/day neutral types!! Variety – If it is an everbearer, day neutral, variety it will produce almost all year. June/spring bearers put out a prolific batch in June, then it’s over. No amount of care or feeding is going to make that plant have berries after June. Sorry. Best to get the varieties your local nursery carries. Or talk with them about special ordering well in advance, so they can get the ones you want. Temps – cold weather slows down pollinators. Shaded – believe me, strawberries like all-day sun! If you are going to tuck them in among other plants, be sure to put them on the sunny side! Hungry – think about it! A strawberry plant is often pumping out several berries at a time! They are using up soil nutrition, so feed them! Try a light solution of fish emulsion/kelp every other week over some sprinkled seabird guano or a well aged manure. Give your strawberries a little fertilizer in the 0-10-10 proportions; that’s lots of phosphorus and potassium for strong roots and uptake of nutrients, blooms and fruits! Water – don’t let them dry out, they will stop producing. This month they tend to grow more leaves, send out runners. Clip off the runners for now, so they don’t take your plant’s energy away from producing berries, unless you want more plants right away. Mulching is good. They love pine needle mulch, if you have some about, because they prefer slightly acidic soil. Drape your berries over pine cones to keep them off the ground, out of the slug zone. Age – First year plants and 3rd year plants don’t produce as well. My berries are really tiny! Strawberry varieties vary from mammoth chocolatiers, to midget but mighty tasty alpines. If it isn’t a variety issue, it may be diseased. See below please. Irregular watering Your berry grows fast when it has water, then is restricted when it doesn’t…. Western Tarnished Plant Bugs, feed on the flowers and developing surface seeds that stimulate growth causing misshapen berries, hard clusters of yellow seeds on the tip of the fruit. Clean up debris. Once you see this, you are too late to prevent it any further. Bummer. UC Davis IPM Integrated Pest Management on Lygus Hesperus. Image of typical cat-faced berries. Pollination Strawberry flowers are usually open and attractive to bees only a day or less. Temperatures below 60F, low night temperatures, & high humidity result in inadequate pollination, low yields of small or misshapen fruit. Strawberries require multiple pollination for perfect fruit formation. Generally, as the number of pollinator visits increases, there will be an increase in fruit set, number of seed per fruit, fruit shape, and fruit weight. ABOUT BEES: per NCSU ‘Bees rarely fly when the temperature is below 55°F. Flights seldom intensify until the temperature reaches 70°F. Wind speed beyond 15 miles per hour seriously slows bee activity. Cool, cloudy weather and threatening storms greatly reduce bee flights. In poor weather, bees foraging at more distant locations will remain in the hive, and only those that have been foraging nearby will be active. Pumpkin, squash, and watermelon flowers normally open around daybreak and close by noon; whereas, cucumbers, strawberries, and muskmelons generally remain open the entire day.’ So if the weather isn’t right THE DAY OR MORNING your flower opens….. Whole plant has yellow leaves. The most common cause is nutrient deficiencies due to overwatering. 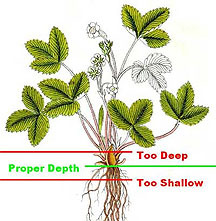 Overwatering causes poor root growth making it difficult to move enough water to the leaves during hot weather. Lay back on watering; give your babies some Nitrogen –fish emulsion/kelp. Pecked If birds are pecking your berries, put bird netting or a wire dome over them. 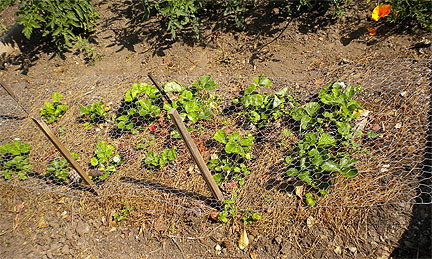 Rebecca & David Barker, Pilgrim Terrace Community Garden, Plot 41, staked the chicken wire in place, push it up to harvest, down to just the right height when done! Holes in them, Chewed Silvery slime trails are the giveaway! Use the pine cones to drape your berries over to keep them off the ground. Put down some Sluggo or the like, to kill off night-time nibblers, slugs, snails. Harvest regularly before the berry gets soft and smelly, just before the buglets are attracted! Those little black pointy worms? I’m trying to find out what they are. If you know, let me know, ok?! Strawberry Diseases StrawberryPlants.org for full list of diseases. Here’s a link to the 3 Most common leaf diseases with images. Angular Leaf Spot – exactly that. Spotted leaves. A cosmetic problem until it isn’t. Your plant will produce, but it won’t thrive. Spread by water, harvest before you water, water under the leaves, remove badly spotted leaves, don’t use them as mulch, wash your hands before going on to another plant. Strawberry Blight – the fungus is often confused with angular leaf spot, overwinters in old leaves, remove them. Remove old leaves from runner plants before setting. All day sun, well-drained soil, in an area with circulation, equals less fungus. For good air circulation, plant far enough apart, remove weeds, remove, replant and/or give away runner baby sets. Plant resistant varieties for your area of your state. Discussion of SoCal varieties. When you buy new plants be sure they are certified from a disease-free nursery. If you use a fungicide, spray the underside of leaves as well as the tops. Chandler is the most widely commercially grown strawberry in California. High yield, early producer, large southern berry. It’s a June bearer, so if you want year round supply, this is not your berry. Seascape is an ever-bearing, big day neutral, all year strawberry, harvests are more abundant in late spring. High yield, resistant to most diseases except leaf spot. Reliable producer in fall, performs well in hot, dry climates. Berry is bright red inside and out! Oso Grande Another June bearer, high yield big berry, good in warm climates. Eat your red plump strawberries! Fresh from your garden, strawberry Sundae, strawberry sauce, strawberry pie, cake, bread, strawberry ice cream, whipped cream, yoghurt, cream cheese, cheesecake, strawberry shake, chocolate dipped, strawberry lemonade, strawberry Syrah, and, as always, the traditional, Strawberry Shortcake!! Do I have to rip up my lawn? You can do lasagna gardening/sheet composting right on top, start with cardboard/newspaper. Do I have to do a major portion of my lawn? You can do any part you want, big or small, your call! But I don’t want to do my front lawn. You don’t have to! It’s yours, do what makes you happy! You only need 6 to 8 hours of sun to grow veggies, any space, corridor that has that, works. Is it really hard work? Using the lasagna/sheet composting method is no harder than gathering the materials to do it! There is NO DIGGING! And you don’t have to build raised beds. Building soil on top of your lawn can make a lovely undulating landscape. Frameless raised beds have plantable sloped sides! Is it ugly? Could be, but how you do it is up to you! It can be integrated along/among border landscaping plants, you don’t have to have raised beds at all. If you want to though, you can make really attractive raised beds with beautiful materials, ie a lovely rock wall, terracing. You can cover an unsightly area like the edge under a south facing deck. There are so many lovely options! I don’t want to wait months before I can plant! You can plant the same day! Just pull back a planting hole, throw in compost, bought or made by you, plus any amendments you want, just like usual, and plant NOW! No waiting at all! Wet green layers go above dry browns so the juicy decomposing stuff seeps down, keeping the brown stuff moist! Straw is good in a brown/dry layer because air can pass through it, keeping the pile aerated! Throw in some red wriggler worms to work the pile, make castings! Maybe toss in some soil to ‘innoculate’ the pile with soil organisms. Don’t worry overmuch about exactness of ingredients in your layers as you chop and drop greens from your garden/yard. In fact, you can mix them up! But do put in manures for Nitrogen (N). Decomposing plants use N to decompose, so add a little so your growing plants will have an adequate supply. If you can, make your pile at least 18” high; it is going to sink down as it decomposes. Thinner layers, or layers that have been mixed, and smaller pieces, decompose faster. If you like, cover the whole pile with some pretty mulch when you are done! Or tarp it to keep things moist until ready for use. When you plant, especially in ‘new’ soil, sprinkle the roots of your transplants with mycorrhizal fungi! The fungi make micro filaments throughout your soil that increase your plants’ uptake of minerals, especially phosphorus that builds strong roots and increases blooming, fruiting! Anybody can lasagna garden/sheet compost in any garden, any part of a garden, any or all the time! It’s a time honored soil building/restoration technique! Happy planting! Now IS still a good time to start your seeds, especially your true heat lovers – eggplant, limas, melons, okra, peppers and pumpkins, and for you SoCal coastal marine layer gardeners, tomatoes! When you start them, for your sanity, label your seedlings with their name and date! Hmph. How hard could it be, soaking seeds?! It isn’t, but it turns out there are lots of options and some specifics for better results! Whether you only soak your seeds, or go on to presprouting, is your choice. For me, I found once they started sprouting, growth was rapid! At that stage, they can’t dry out or be too wet and rot, so you have to be ready to plant! Also, it is more difficult to very carefully plant sprouted seeds. They are delicate! So if you are at all bull-in-the-China-shop like I am, it may pay to only presoak! The main arguments for seed soaking are not only for a speedier garden [Sprouted seed will grow in soils too cool for germination, YES!, but also for more complete germination of all seeds planted. You can get germination results in 3 to 4 days, while without pre-soaking it may take 2 weeks of unfavorable germinating conditions, and you may get none. Whether you plant directly in the ground, or for those of you at Pilgrim Terrace planning on using the greenhouse, here is some very useful info on seed soaking! The seed coat that surrounds the living seed sometimes does more than just protect it. The seed coats of many plants contain chemicals that inhibit germination of the seeds. This keeps them from germinating too early or when only briefly exposed to moisture. Some gardeners who are interested in rapid germination soak and wash their seeds to get around these germination inhibitors. Some types of peppers, such as jalapenos, may germinate more rapidly if soaked in a couple of changes of lukewarm water before planting. 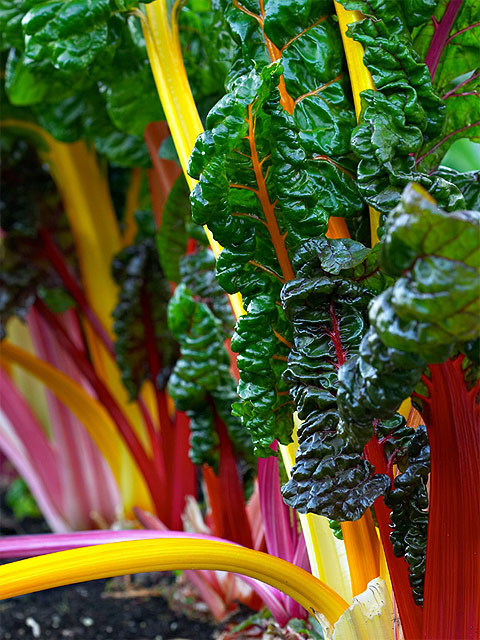 Beet and chard seeds also have a germination inhibitor; these strange-looking lumpy “seeds” are not really seeds at all but dried-up fruits of the plant, each of which contains several seeds. (That’s why beets and chard always need to be thinned.) The hard fruit covering contains a germination inhibitor, but if you soak the seed (fruit) overnight, it will absorb too much water, and you will still have poor germination.Seed coats play other important roles in the lives of plants. They regulate how much oxygen, water, and light the seeds receive. You may have planted beans or corn in soil that was very moist but cool and were dismayed by subsequent poor germination. The seed coats of these crops can allow water to rush into the seeds too quickly, as with beets. This rapid water uptake can damage the tender cell membranes, permanently harming a young seedling so it grows slowly or preventing germination altogether. This process has been termed imbibitional shock, or soaking injury. Soaking injury can occur at any time with some crops, but cold temperatures make it worse.To avoid soaking injury, you can allow the seeds of sensitive crops such as beans, beets, and corn to soak up water gradually before planting them in the garden. This method is called seed moisturization. One way to do this is to place them in moist vermiculite for eight to sixteen hours before planting. An easier method for most home gardeners is to place damp paper towels on a sheet of wax paper, sprinkle on the seeds you want to hydrate, and roll up the towels with the wax paper on the outside. Leave the seeds inside the paper for eight to sixteen hours at room temperature. Don’t let them sit for more than nineteen hours, or the delicate seedling root may begin to penetrate the seed coat, and you could damage it during planting. Things to know plucked from the web…. Start with viable seed. Check the date on the seed pack to see when it was packaged for. It won’t do you a bit of good, for example, to presoak lettuce seeds and expect them to germinate in a soil temp of 87 degrees, as they prefer a cooler-temperature. So start your pre-soaked seeds at the temperature and time you generally plant. Pre-soaking just gives you faster performance under normal conditions. There are huge variations in the length of time people soak their seeds! Tomato and Pepper seeds are soaked 6 hours, no more that because they can suffocate from lack of air. …overnight in tepid water. That is water that is warm, but not hot. I make sure that the seeds are covered at least twice their size with water. I don’t add anything to the water, but when planting them, I do water them in with manure tea. Soak them for 12 hours in compost tea, then rinse & drain. Rinse & drain each day, keeps the seeds moist until you have roots. With beans, the roots emerge from the scar. Plant the seed endwise, the root pointing down. Plant roots and shoots at the soil surface, the bulk of the seed below the soil mix surface. Keep moist. Soaked in tepid well water for six hours. The water was then poured off and the seeds were rinsed a couple times a day with some misting in between. The seeds were planted once they had visible roots. 12 hours in water, then drain and leave for 12 hours, then keep repeating the process until they split their skins and start showing a root. It normally only takes 2 or 3 days and then I plant out. When legume (peas/beans) seed coats split, the seeds may lose vital nutrients and fall prey to disease fungi when planted. Drain them after they have been submerged for an hour. I do think I’ve oversoaked bean and pea seeds in the past, almost to the point where they are falling apart, and that it has weakened them. The soak time would depend on the size of the seed I would think, but never more than a few hours. OKRA !!!! (48 hours) Or… I presoak my okra seed in 1 pint of warm water containing 1 tablespoon of household bleach to pre-soften the seed for 24 hours before planting. Cucurbita (cucs, luffas, melons, squash) seeds only needs to be soaked to loosen up the shell. Gourd seeds in particular are very tough and some people even scratch the sides of tips (scarify) to make it easier to germinate. I soaked them a little and also wrap them in wet toilet tissue before planting. This will help to keep them moist. The soaking solution varies…see compost tea, manure tea above. And what about worm tea?! Last year I soaked my bean seeds in a kelp solution before planting and they sprouted in about 2 days. I would never use bleach in the soaking solution. If you are worried about contamination, try soaking in chamomile tea or 3% hydrogen peroxide instead. If the seed is purchased, I wouldn’t bother. Hydrogen peroxide, both in soak and rinse solutions:1 oz. of 3% H²O² to 1 pint of water. Sprouts come up faster. Some people have reported 3/4″ sprouts in 24 hours. When you plant the seedlings dig the hole and spray it with peroxide. Wet it good and then wet the roots of the seedlings or small plant. The vegetable that gave me a problem was the cabbage. I was determined to conquer the cabbageworm. Years ago I sprayed the cabbage plants with peroxide to no avail. This year I soaked the cabbage seeds before planting them. There were no signs of the bug until the cabbage plants were almost full grown, then I poured about a quarter of cup of 8% peroxide over the cabbage, letting it flow down into the layers of the leaves. That stopped the cabbage bugs. Please see more tips… Part 2! Scarifying your seed, how to plant wet seed, better hot weather germination, water tricks!